To sum up the results of a series of actions is the easiest thing to do, because the actions contain links that demonstrate tendencies, they hide the codes of a future that has not yet been fully revealed, but can be guessed. To analyze a void is not more difficult – it is not possible at all. A vacuum is aggressively silent, sending in response to all questions a guarded "I wasn’t here, am not here now, and won’t be here in the future.” Nevertheless, the upside of what happens when a void gapes in the space that is organized by human activity is that by its silence it exposes the poverty and futility of articulation. 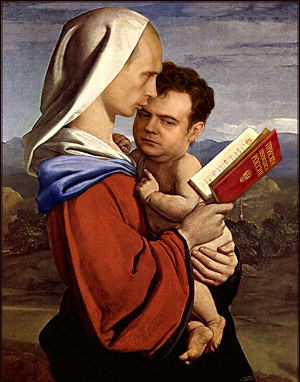 When it became clear that Medvedev would be appointed in place of his predecessor, hope began to dawn in the camp of the people who hated Kadyrov. A group made up of former and current parliamentary deputies, Kadyrov’s opponents in the Kremlin and the law enforcement structures, immediately began to intensify its efforts. In the absence of other candidates, the anti-Kadyrov lobby gathered around the Yamadayev brothers, who were to bring about the overthrow of the Kadyrov clan in the Moscow’s corridors of power. At the time, there was persistent talk about how Medvedev could not abide Kadyrov, how he found the political regime that had established itself in Chechnya deeply abhorrent. After the Russian presidential elections it appears that somehow the lobbyists managed to break their way into the Kremlin. They claimed that the Kremlin fully understood the need for a change of government in the republic. However, they did not have the necessary means with which to make that change. They would have to wait a year or so, they said, until Medvedev had built his own government machine, and only then would it be possible for them to go into battle with open visors. "At all events,” men like ex-deputy Frants Klintsevich proclaimed without a flicker of doubt, “the fate of the criminal upstart who has crushed the republic under him is sealed in advance." And now it is the first anniversary of Dmitry Medvedev’s presidency. Because the timing of Kadyrov’s political death has been determined only approximately, we may, of course, assume that the current Russian president has some leeway before he needs to carry out the termination of the fringe dweller of Khosi-Yurt. But even in this space of time a certain combination of pieces has developed in the political chess-game, allowing us to draw specific conclusions. So what are the results of all the hard work the Kremlin’s new master has done in relation to Chechnya? First of all, Ruslan Yamadayev, the only candidate who might have been considered a possible replacement for Kadyrov, has been killed. That complicates the situation, of course, but Medvedev’s dislike of Kadyrov (if he has ever felt it) cannot not simply be expected to go down like a benign swelling. In other words, something has to be done with Putin’s front man, who is demonstrating a flagrant disregard for the rule of law that Medvedev has undertaken to restore. But no, we can confidently state that during the “Medvedev” year Kadyrov’s position in Chechnya has only grown stronger. What is more, he has succeeded in increasing the spread of repression and violence on an almost planetary scale. In a sense, the killings in Europe, Turkey, the UAE are Kadyrov’s personal stamp on the forehead of the “legalist" Medvedev: "You’re a nobody.” And the elegant flourish belowr the brutal inscription reads: “V. Putin." An almost demonstrative disregard for Putin’s "heir" is the current Chechen government’s most typical characteristic. It is highly probable that last year the anti-Kadyrov lobby indulged in wishful thinking, and that Medvedev’s complaints about Kadyrov were no more than a fantasy. But in the end no one has marked out the borders of the "void" that emerged in the Kremlin after the elections as clearly as Kadyrov has done.. There was no resentment, no dissatisfaction. As though it were not all an improvisation, but events were strictly following a pre-written script, as though Kadyrov had been issued special orders so that no one would start to have doubts about who really governed Russia. The signifier became part of the plan as a constant value, while the signified had no right to feel any emotions, because he had been informed of the agenda in advance. The "Medvedev” year has also revealed the stylistic inconsistency of the resident of the Kremlin’s now lacklustre chambers in its Caucasus annex. Kadyrov is of course bloody and bad. However, his bloody activism is a secondary matter dependent on other factors, and determined by them. All the visible space behind it is covered by a greater evil, which is the imperative and the higher justification for the blood. It sometimes appears that all of Kadyrov’s excesses -- the horses, the expensive cars, the hundred dollar bills scattered above the heads of guests – are a cry of despair from a man who senses his own artificiality and complete vulnerability in the face of a terrible, cold power, the power of the highest ruler, who only needs to change the direction of his gaze for the insolent dzhigit to become a wet patch on the floor. All the crimes were devised and rationalized before Kadyrov – he is following a path that has already been laid down, and as he chews his pencil is carefully tracing the outline drawn in his student notebook by a cruel instructor. The world has not changed by one iota, and throughout the year that has passed no leaf has stirred. The celestial ruler still sits on his lofty throne, observing the brawls of the wild aborigenes with the dispassionate curiosity of a natural scientist. In this observer’s presence Kadyrov is fated not to diverge even one millimetre from the destiny that has been allotted him. Where is the source of the will that preserves the unity of time, place and action for the little man whose hobby is racehorses? Certainly not in the Kremlin. In Chechnya the joke is that if one day Putin were to wake up fifteen minutes later, Kadyrov’s corpse would already be going cold. This savage witticism brings out the essence of the Kremlin’s decadence. Dmitry Medvedev can stay awake for days and nights on end – on the fate of the young man from Khosi-Yurt it will have no effect whatsoever.